(two pianos, piano duet and piano solo). Programme: Bizet Carmen “Fantasy”, Chopin “Raindrop Prelude”, Liszt “Hungarian Rhapsody No. 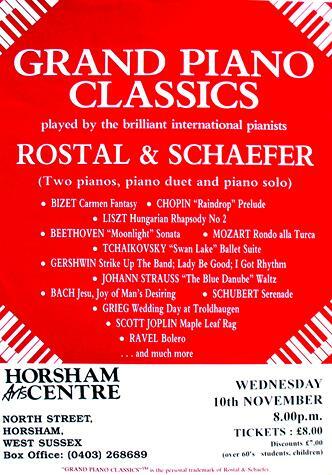 2”, Beethoven “Moonlight Sonata”, Mozart “Rondo alla Turca”, Tchaikovsky “Swan Lane, Ballet Suite”, Gershwin “Strike up the Band”, “Lady Be Good”, “I got Rhythm”, Johann Strauss “The Blue Danube Waltz”, Bach “Jesu, Joy of Man’s Desiring”, Schubert “Serenade”, Grieg “Wedding Day at Troldhaugen”, Scott Joplin “Maple Leaf Rag”, Ravel “Bolero” and much more. Wednesday 10th November 8 pm, Tickets £8.